A good dip makes a party! When I first tasted this dip at a party thrown by my friend Jenny Vergos, I knew I needed the recipe! Jenny is always whipping up something yummy. 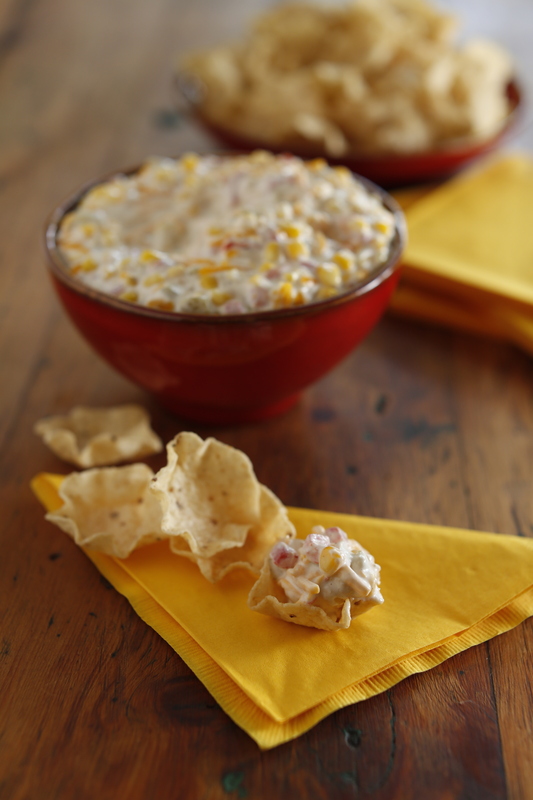 This simple dip is no exception. 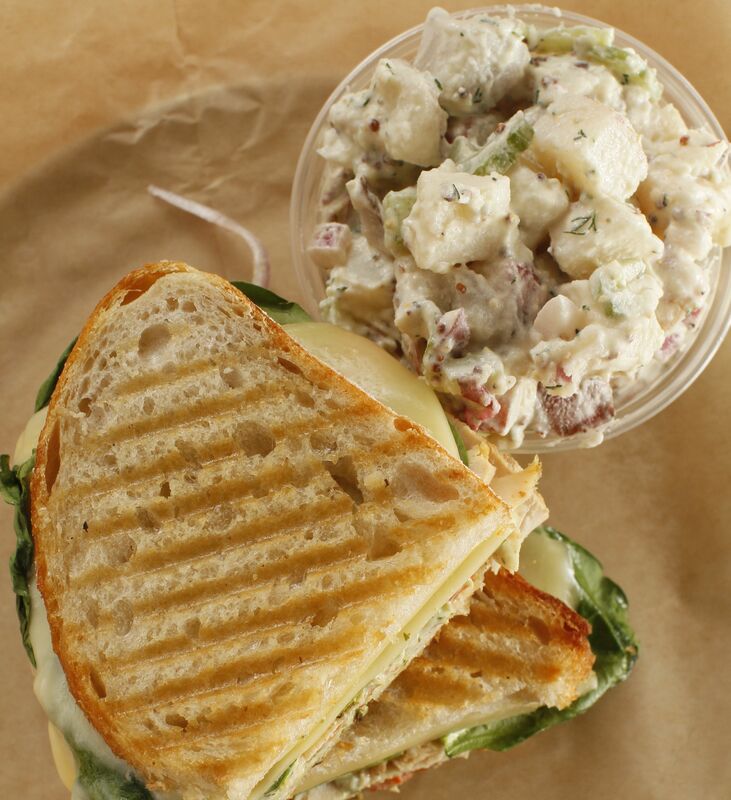 Made with pantry staples, it is packed with flavor. 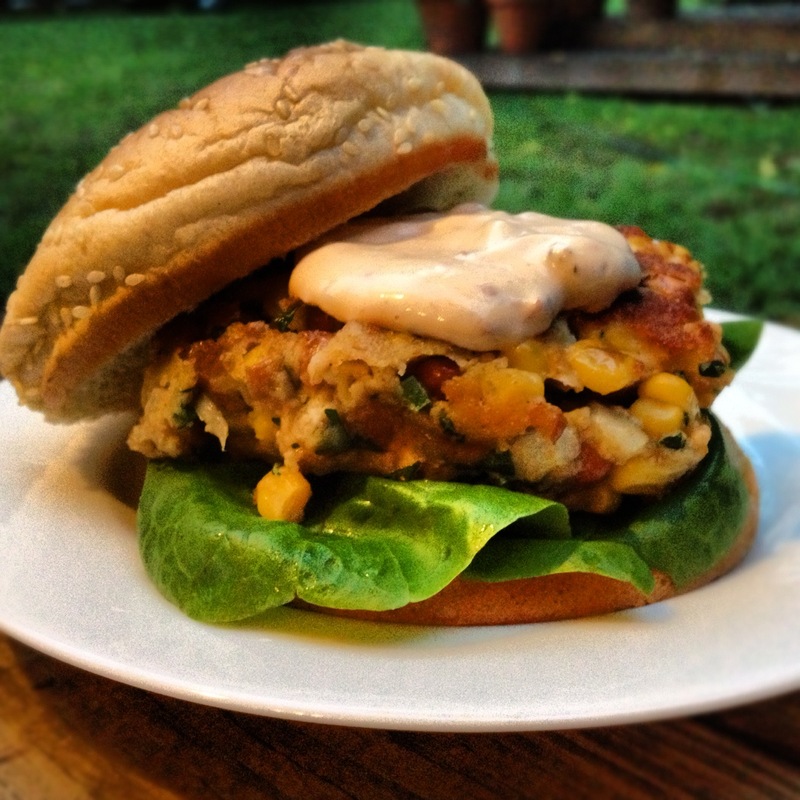 I decided to feature it in my cookbook “The Southern Pantry Cookbook” because it was so good. I can guarantee folks at your next party will be asking you for the recipe just like I asked Jenny. 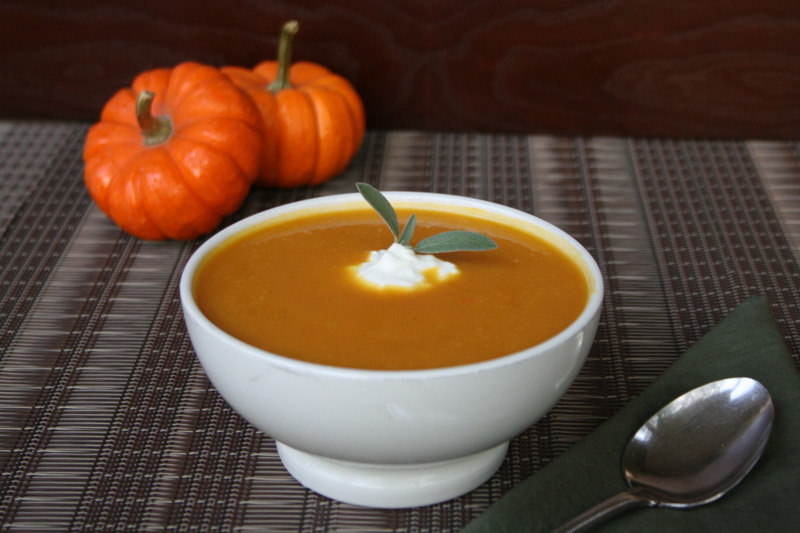 In a large mixing bowl, stir together the sour cream, mayonnaise, and garlic powder. Add the corn, pimentos, green chilies, and cheddar cheese. Stir until well combined. Season with salt and pepper to taste. Place the mixture in a 2-quart baking dish. Bake until golden brown and bubbly, about 30 minutes. Serve warm. Cooking Tip: For a spicier dip, add a 1/4 cup diced jalapeños. Do-Ahead: This dip can be assembled one day in advance. Store covered in the refrigerator until ready to bake. Cinco de Mayo may be this weekend, but you can have a fiesta any night for dinner with this simple and fast recipe. Cooking “South of the Border” dishes at home is easy thanks to all the wonderful Mexican foods that are now available at the supermarket. This family-friendly enchilada dish gets its flavor from the distinctive salsa verde. Salsa verde is a tangy green salsa made from tomatillos instead of tomatoes. It is possible to make your own, but it’s more convenient, and equally as tasty, to use the jarred variety. Using short-cut ingredients like jarred salsas, shredded cheeses, and rotisserie chickens can take the stress out of cooking, without compromising flavor. These enchiladas can be assembled up to one day in advance and refrigerated, making them perfect for both everyday dinners and for entertaining. Place the cooked chicken in a medium mixing bowl. Add the sour cream and 1 cup of the salsa verde and toss to evenly coat. Season with salt and pepper to taste. Set aside. Evenly spread 1 cup of the remaining salsa verde over the bottom of a 9- x 13-inch baking dish. Warm the corn tortillas according to the package directions. In the center of each tortilla, place 1/12of the chicken mixture (about 2 generous spoonfuls), sprinkle with a generous pinch of the cheese, and roll the tortilla to enclose the filling. Place the enchilada seam side down in the pan. Repeat with the remaining tortillas. 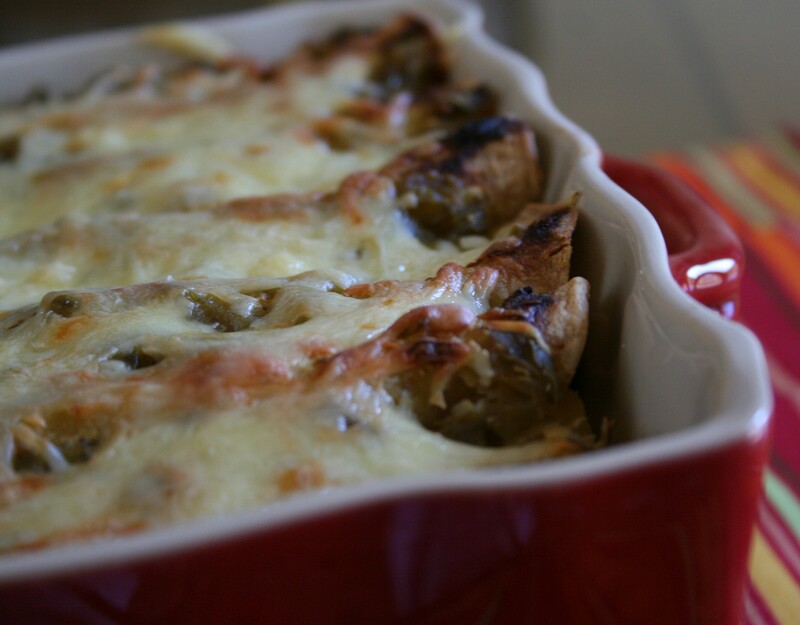 Pour the remaining salsa verde over the top of the enchiladas and sprinkle with the remaining cheese. Bake uncovered until the cheese is melted and bubbly on top, about 30 minutes. Serve hot. Cooking Tip: In order to make the tortillas pliable enough to roll, you need to warm them. Warm corn tortillas on an ungreased skillet over medium-high heat for 10 seconds on each side or by wrapping up 4 to 6 tortillas between two damp paper towels and microwaving for 30 seconds. I should call this recipe Sarah’s Disappearing Banana Bread! My youngest daughter can’t not get enough of banana bread. It is one of her favorite treats to eat … and to make with her momma! Sarah has the unfortunate curse of being allergic to nuts, and unfortunately most versions of this quick bread are made with walnuts. She had a wonderful nut-less banana bread last summer we found at the Malibu Farmers Market. Since then, we have been on a quest to re-create a similar version. Many of the recipes we tried were delicious … but none had the moistness of the one we had enjoyed last summer. Then one day a friend told me to try adding sour cream to the mix. It was a brilliant suggestion! The sour cream gave the bread that delicious moistness we were lacking with other recipes we tried. The chocolate chips were Sarah’s idea … my little sous-chef always knows how to make a sweet over the top! Preheat the oven to 350 degrees. 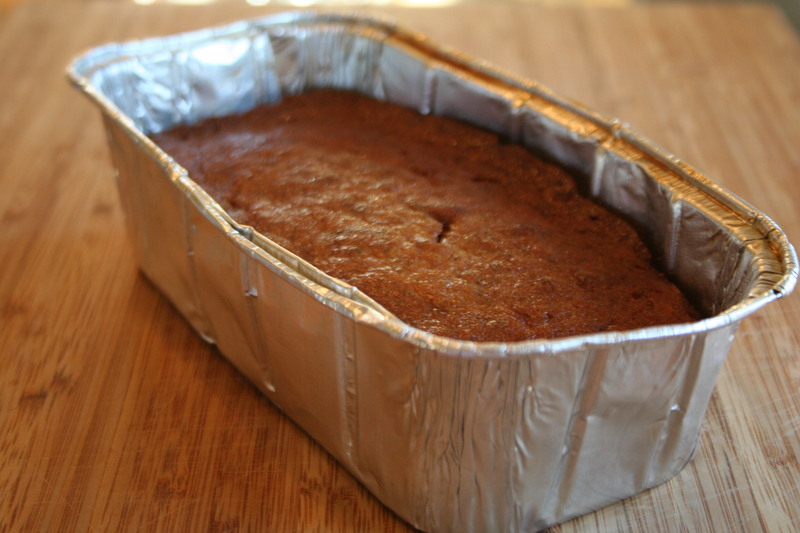 Spray a 9 x 5 -inch loaf pan with nonstick baking spray. In a medium mixing bowl, combine the flour, baking soda, and salt. Set aside. In the bowl of an electric mixer, beat the butter and sugar until light and fluffy. Add the eggs and mix until well combined. Add the reserved flour mixture and mix until well blended. Add the bananas, sour cream, vanilla extract, and cinnamon and stir to blend. Stir in the chocolate chips. Spoon the batter into the prepared pan. Bake until a toothpick inserted into the center comes out clean, about for 60 to 70 minutes. Remove the bread from the oven and cool in the pan on a wire rack just until cool enough to handle, about 10 minutes. Remove the bread from the pan and place onto a wire rack to cool. Cooking Tip: It happens to all of us. Some days bananas ripen faster than we can eat them. If I have bananas that are overly ripe, I throw them in a Ziploc bag in the freezer. That way, I always have ripe bananas on hand to make this bread and I am not wasting food. Variation: If you are not allergic to nuts like Sarah, add a 1/2 cup of chopped walnuts to the batter for what I’d call a “Chunky Monkey” version! Dijon Mustard transforms classic potato salad into an out-of-the-ordinary side dish. In a large stockpot place the potatoes, 1 teaspoon of the salt, and enough cold water to cover the potatoes by 1 inch. Over high heat, bring to a boil. Reduce the heat to medium-low and simmer until the potatoes are fork tender, about 20 to 25 minutes. Drain and rinse with cold water to stop the cooking. Place the potatoes in a large mixing bowl. Add the mayonnaise, sour cream, French’s Dijon mustard, celery, red onion, and dill. Toss until well combined. Season with salt and pepper to taste. Serve chilled. Variation: If you prefer, feel free to peel the potatoes before cooking. My grandmother used to have a fig tree outside her kitchen door. I have vivid memories of my Dad heading straight out the door to pick a few the moment we would arrive for a visit. As a kid, I have to admit that I wasn’t a huge fan of figs. The only way I ever ate them was overly processed in a Fig Newton! But thank goodness my taste buds matured! Now, just like my Dad, I can’t get enough of this luscious fruit. 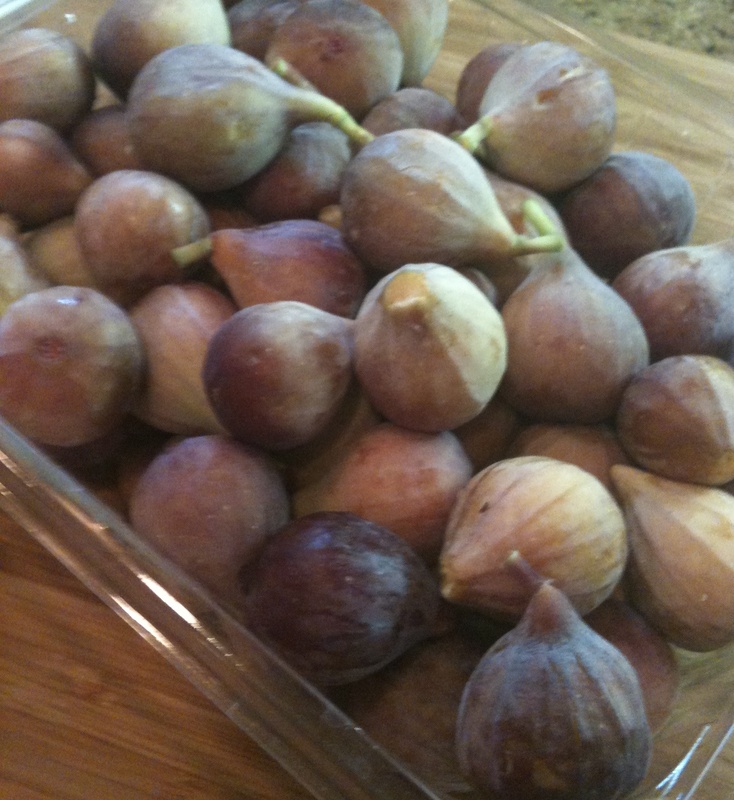 Recently, a friend dropped off a huge container of figs she picked at her in-laws farm. There were definitely more of these ripe little treasures than I could reasonably snack on before they would turn bad. So I decided to try to imitate a version of a divine ice cream Chef Stephen Hassinger at the Inn at Hunt Phelan (Memphis, TN) dishes up each summer. First, I made a quick and easy jam with the ripe figs. Some recipes may call for peeling the figs but I think leaving the fig skins on makes for an even more intense flavor. (Plus it’s easier!) Instead of plain vanilla for the ice cream base, I added a bit of sour cream. The tartness of the sour cream offered a nice contrast to the sweetness of the figs. Praline pecans were an added crunchy indulgence. Hope you enjoy this creamy treat as much as we did! Puree the figs in a food processor or blender. In a medium heavy saucepan, combine the fig puree and the sugar. Cook over medium heat, stirring often, until the figs have thickened into a jam, about 30 minutes. Refrigerate until ready to use. In the bowl of an electric mixer, whisk together the egg yolks, sugar and salt until light and fluffy, 1 to 2 minutes. In a heavy saucepan, combine the milk, whipping cream and vanilla extract. Cook over medium heat until just simmering. Do not boil. Slowly pour the hot cream mixture into the egg mixture, whisking as you pour. Return the cream mixture to the saucepan. Cook over medium-low heat, stirring constantly with a wooden spoon, until the custard thickens and coats the back of the spoon, about 6 minutes. Strain the custard into a clean bowl. Whisk in the sour cream. Cool the custard over an ice bath until room temperature. Refrigerate for at least 2 hours or overnight. Freeze in an ice cream maker following the manufacturer’s instructions. After the ice cream stiffens (about 2 minutes before it is done), add the fig jam, 1 spoonful at a time, and the pecans. Then continue freezing until the ice cream is ready. This fig jam recipe is so tasty. Feel free to save a little for your morning toast. It will keep in your refrigerator, covered, for one week. If figs aren’t in season, you can still enjoy this ice cream. Substitute your favorite jarred Fig Jam/Preserves.